How do you find out about new restaurants to try or Burgers you need to eat? Friends, word of mouth, Food pictures on Instagram, media outlets, TV, sky writing, smoke signals? Chances are it’s probably several of these. I do too. I also get a ton of recommendations from Burger lovers like you who read this blog and then tell me about a Burger they love. Very infrequently do I just happen upon a Burger, let a lone a Burger worth eating, tweeting, writing and reading about. But, then it happens. I was walking through Greenpoint, Brooklyn the other when I came upon a restaurant I had to walk into. Located through the entrance of and then at the back of a Subway restaurant, you’ll find White Burger. It’s a totally separate business with it’s own counter, sign and grill but it is most certainly inside a chain fast food sandwich shop. The menu is rather interesting. 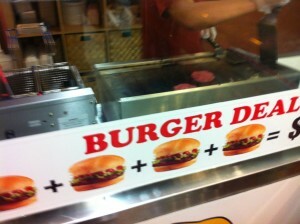 They offer Burgers, $1.25, Cheeseburgers, $1.50 and Juices and Smoothies, $4.99. Whomever came up with this concept is worthy of an interview. Juices aside, once you’ve made the terribly difficult and intense decision between Cheese or no Cheese and order your Burgers, the serve will pull out the appropriate globs of fresh Ground Beef, slap them on the flat griddle and then ask you a very important question to which there is only one answer. Do you want Onions? YES! YES OF COURSE YOU WANT ONIONS. Then a few moments later, you have an appropriately made Sliders which you can dine in at one of the few small tables or take your Sliders to go. Sliders are a lost art form in the walls of NYC (unless you go to Mark Burger). I can’t understand why because they are freaking delicious, especially when made correctly. I love them so much that I would eat them anywhere. 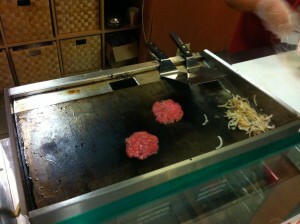 It is to me the classic American Burger and should be celebrate. After ordering, I had no idea what i was in for so when I saw the server slap down to the two Fresh Patties, my eyeballs almost popped out of my skull. 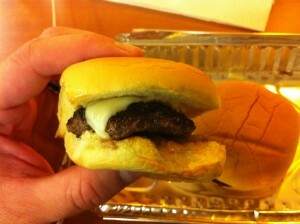 For $3.00 I got two freshly made, piping hot, juicy Sliders with Grilled Onions on small squishy Buns. It’s a good thing I don’t live closer because this little neighborhood gem would easily be on my local eating route, especially after a few brewski’s at the local pub. 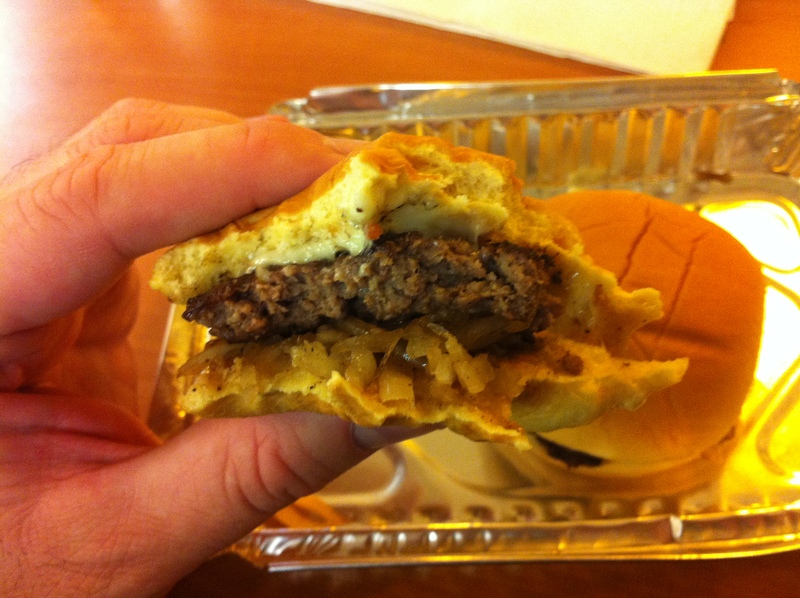 White Burger in Greenpoint, Brooklyn is properly making Sliders for $1.50 and you need to try them. 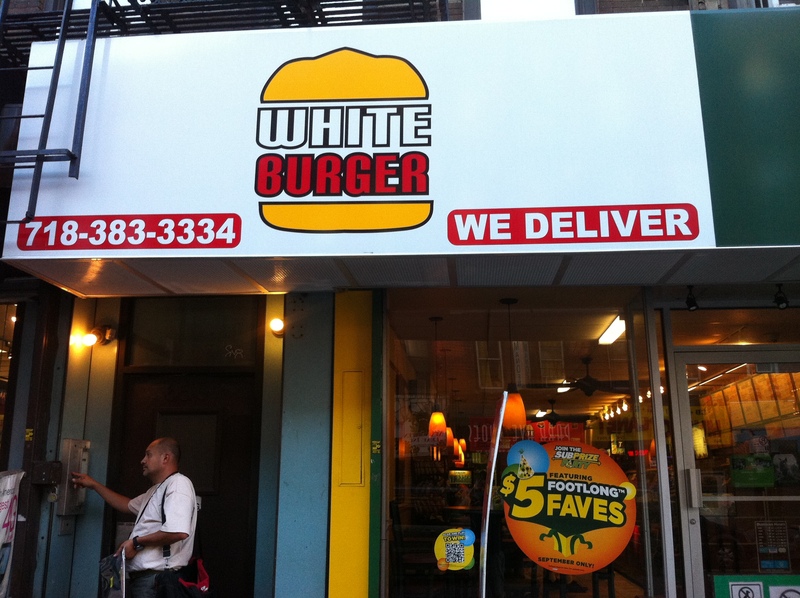 White Burger scores a 1 on The Rev Meter. This entry was posted in Brooklyn, Burgers, Hamburgers, New York, Sliders and tagged "white burger subway", "white burger", best burger nyc, brooklyn, burger conquest, cheese, ciancio, french fries, greenpoint, hamburger, new york, ny, nyc, rev, review, sliders, subway, the rev meter for social community. Bookmark the permalink.